Dr. Pan’s philosophy centers on restoring or improving one’s natural appearance, rather than drastic alteration. Through education and instruction, she demonstrates to her patients why she advises certain interventions and the logic behind her thought process. That way, her patients fully understand the recommended procedures. Her surgical specialties include breast implants / augmentation, breast lift, breast lift with implants, breast reduction, breast reconstruction, breast fat transfer, tummy tucks / abdominoplasty and mommy makeovers. View some before and after images of Dr. Pan’s specialties below. Dr. Pan also specializes in non-invasive treatments such as Ultherapy, Kybella and CoolSculpting as well as injectables such as Botox, Dysport, Xeomin, Juvederm, Restylane, and Radiesse. In addition to providing excellent surgical care, Dr. Pan also feels it is important to research and provide the latest non-invasive aesthetic technologies at Esana. Since her formative residency years, Dr. Pan has donated her time and efforts to providing plastic surgery to those in need, travelling to such remotely underserved countries including Morocco, Thailand, Colombia, and several times to the Philippines. While there, she performed repairs of cleft lips, burn traumas, and birth defects. For her repeated medical missions, she was awarded the Philippine American Association of Connecticut Service Award “for her untiring and continued support to improve the quality of life of indigent Filipinos” in 2010. She can also be found sponsoring charitable events around the greater New Haven area. 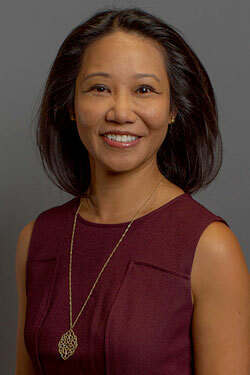 Dr. Deborah Pan is a board-certiﬁed female plastic surgeon serving all of greater New Haven and Fairfield counties, and has patients from as far away as New York City to the Boston area. She completed her higher education at the ﬁnest institutions, graduating as valedictorian of her high school and going on to attend Harvard University, The Johns Hopkins University School of Medicine, and then completed her general surgery and plastic surgery training at Yale University. Since ﬁnishing her training, she has dedicated herself to serving the Connecticut population. She founded Esana Plastic Surgery Center & MedSpa in 2006, three years after starting her practice in New Haven. As the first female plastic surgeon in New Haven, her practice and reputation quickly grew for her outstanding work in breast reconstruction as well as cosmetic surgery of the breast, body, and face. She has won the New Haven Advocate’s Readers’ Poll for Best Cosmetic Surgeon numerous times, and Esana has also won multiple awards from Connecticut Magazine, New Haven Living Magazine, and the New Haven Advocate. In the past she has also appeared as a guest on WTNH’s Connecticut Style, as well as being interviewed by local publications for her opinions on the latest in plastic and reconstructive surgery topics. Her interests outside of work include: worldwide travel and food, and she can often be found participating in yoga, Pilates, tennis, golf, skiing and paddle boarding. She has been athletic all her life, and tries to maintain a balance of healthy living and work responsibilities. Always very satisfied with Dr. Davila's work.